On his debut album, a rapping Rumpelstiltskin spins style, social commentary, and skateboarding into hip-hop gold. Reviewing Lupe Fiasco's debut record, Food and Liquor, without mentioning Kanye West is nearly impossible. First, both rappers hail from the Chicago and write rhymes that draw from that city's spirit. Second, most listeners who recognize Fiasco will know the rapper from his guest appearance on West's hit single, "Touch the Sky". Finally, one has to look back to West's first album to find a debut with a cultural impact comparable to Fiasco's. When West delivered The College Dropout in 2004, he expanded hip-hop discourse to include themes such as career pressure, academic dissatisfaction, and medical procedures. 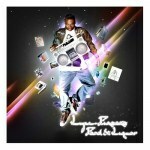 Fiasco has again expanded rap's reach with Food and Liquor, one of the most eclectic and profound rap albums of the 21st century. Fiasco's personality is, to say the least, atypical of a traditional rap star. He prefers a gold Casio watch to a diamond-studded timepiece. He is a devout Muslim. He loves skateboarding, and he holds four black belts in karate. On Food and Liquor, he brings all these traits to bear on his lyrics, which are consistently marked by sharp wit and unconventional insight. Ever since hip-hop emerged as a commercial genre, critics have derided its often-blatant violence, disrespect, and misogyny. Food and Liquor is a perfect counter to the argument that such themes are universal in rap. Often, the malevolence that rappers convey through their music is merely a part of their posturing. In an industry where success is measured as much by street credibility as musical credentials, many hip-hop artists create personas that embody the idea of physical dominance as a means to empowerment. On Food and Liquor, Fiasco eschews such posturing, offering something that he says on the second track he hopes is "Real". Throughout the album, he challenges the notion that people empower themselves through violence, and he offers a worldview based on personal freedom and respect. The first major highlight on Food and Liquor is the fourth track, "Kick, Push", which is also the album's first single. Superficially, this track is an ode to skateboarding, and, with all due respect to ILL Mitch, it is the finest example of its kind. Below the surface, though, Fiasco deals with universal themes of adolescence. The song follows the story of a boy whose skateboard takes him through major life events, which include meeting his girlfriend. As the protagonist grows up, he finds himself alienated from mainstream society by his passion for skating, and he takes refuge in his crew and in the freedom he finds whenever he decides to "Kick, push, coast". With his narrative, Fiasco shows how sincere passion can imbue ordinary events with extraordinary significance, and he provides a message of empowerment that transcends the subject matter of skateboarding. Fiasco follows "Kick, Push" with the stellar "I Gotcha". On this track, he contrasts the "pimps", "macks", and "mobsters" of conventional rap with his own lyrics, which he characterizes as demonstrating "realness" and "freshness". On "Hurt Me Soul", he backs these words up, challenging the values common to many hip-hop songs. He shows a genuine conflict between idealism and hedonism with lines like " I used to hate hip-hop, yep, because the women degraded/ But Too $hort made me laugh. Like a hypocrite I played it". Fiasco exposes another brand of hypocrisy on "American Terrorist" when he reminds listeners that fundamentalism can always be dangerous, no matter what religion it supports. Of course, none of Fiasco's rhymes or challenging insights would matter much if they weren't supported by the music or delivered by a capable rapper. Fortunately, Fiasco's rapping and production are rock solid. The emcee's cadence calls to mind the flow of Jay-Z, who was an executive producer for Food and Liquor. Fiasco is a solid rapper on his own right, though: he has strong presence on the mic, and he has no trouble wrapping his sharp tongue around his often-slippery lyrics. He is aided in efforts by some of the finest producers in the business and some notable guests. Jay-Z contributes rhymes to "Pressure", and Jill Scott adds a sultry vocal to the lazy "Daydreamin'". The Neptunes deliver the piano-infused beat on the aforementioned "I Gotcha", while Kanye West mans the production helm for "The Cool". In the end, the album is more introspective than exuberant, but its ruminations are consistently colorful and feature instruments ranging from distorted guitars to lush strings and smooth brass. If one compares Fiasco's successes to those of his counterpart West, the results are mixed. On the one hand, Food and Liquor lacks a track with commercial power comparable to a single like "Gold Digger". On the other hand, it also lacks the less-than-stellar skits, and some of the rampant narcissism that sometimes slightly tarnish West's rap gold. Such comparisons, however, do little to demonstrate the true value of Food and Liquor. The album might not become a rap classic, but it is easily one of the best rap albums of 2006, and maybe one of the top records of any kind to appear this year. If anything, it is a bold statement from a lyricist who is already ahead of many established artists and still coming into his own as an a rapper. With more experience and time to hone his vision, Lupe Fiasco can only get better, and, if Food and Liquor is any indication, the sky's the limit for this brilliant young star.